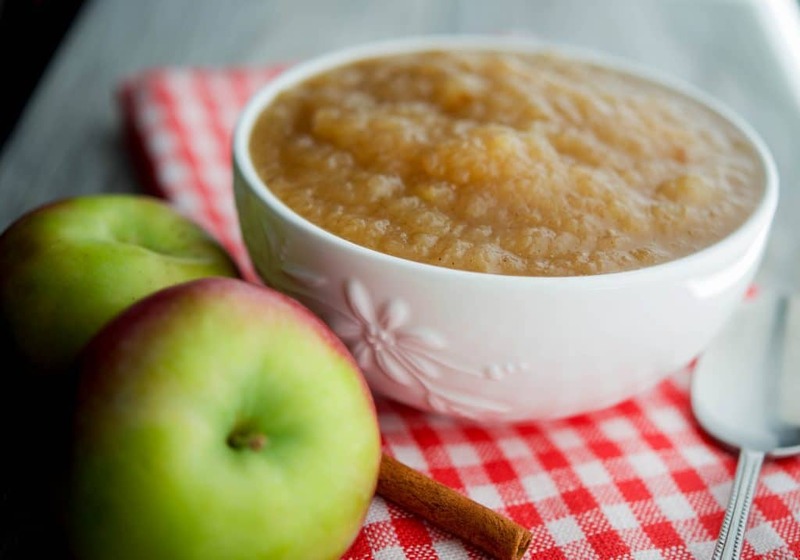 Make your own Homemade Applesauce with fresh picked apples, sugar and spices. The best part is you can make it chunky or smooth, just the way you like it. 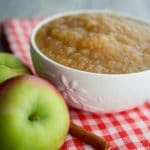 Homemade Applesauce is so easy to make at home, yet I can’t believe I haven’t made it here for you on the blog after all of this time! 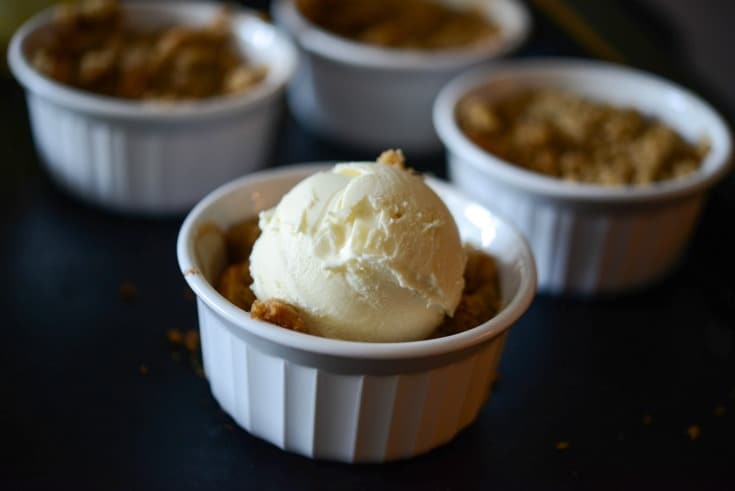 Mainly because when we do venture out to go apple picking, we wind up making apple pie, apple crisp (which is another recipe I have to eventually share with you! ), apple chips or just eat them on their own and before we know it there are no more apples left. So when I had taken pork chops out for dinner one evening recently, I decided to make some applesauce to go with it. For those of you old enough to remember (or watch reruns), every time I hear the word “pork chop”, I can’t help but think of that scene from the Brady Bunch where Peter Brady is trying to impersonate Humphrey Bogart and says they are having “Pork Chops and Applesauce” for dinner. Here, check it out for yourself if you’ve never seen it, but it cracks me up every time. I know, a little corny, but I’m a product of the 70’s and watched a lot of tv back in the day. Anyway, back to this Homemade Applesauce. 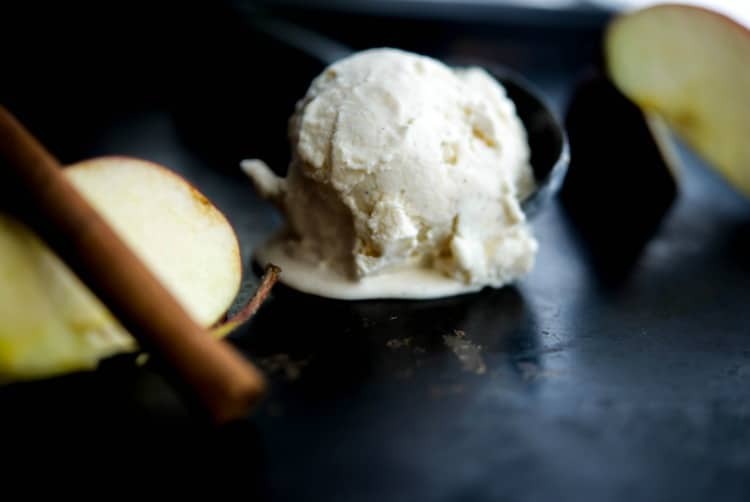 For this recipe all you need are apples, lemon juice, water, sugar, salt, cinnamon and my special added touch, vanilla extract; which really adds a nice touch. I used Cortland apples for this recipe; however, McIntosh or Honeycrisp would work well also. 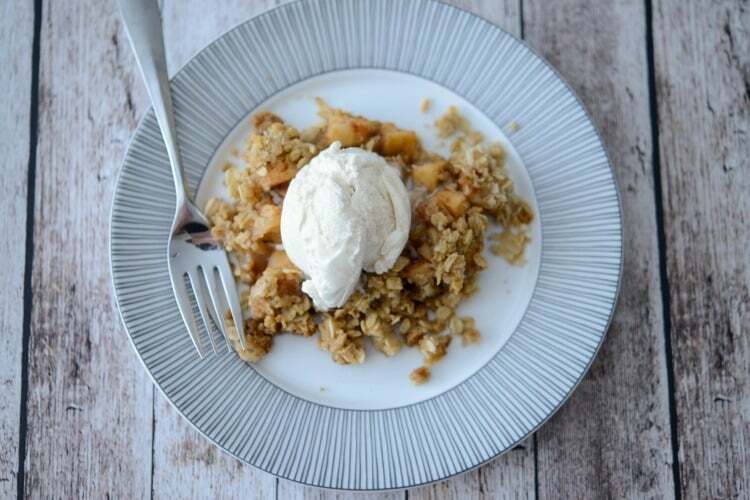 Simply core and peel your apples, place all of the ingredients into a large pot and simmer for 20-30 minutes. You may need to adjust your sugar depending on how tart your apples are. Start with 1/4 cup of sugar and add more as necessary. I have to say this batch of applesauce didn’t last very long at all. Not only did we enjoy it with our baked, breaded pork chops that night, we ate it ‘as is’ for a snack that week as well. ~Enjoy! The recipe dosen’t specify how many cups of sugar. I’m sorry, the recipe card was formatted incorrectly. Use 1/2 cup of granulated sugar + or – depending on your personal preference. Enjoy! I don’t have a way to measure the weight of my apples we went apple picking and I have a ton. In your opinion about how many apples is 4lbs. I should have counted before I cut a peeled but I have probably betweeen12-10 apples. Is 1 cup of water going to be enough because idk I have half a large stock pot full. I think 1 cup of water should be fine. Depending on the size of your apples, it should be about 3 medium apples per lb (12 whole apples). The water shouldn’t be covering the apples completely, it’s to help steam them. If the apples aren’t softening and the liquid has evaporated, add a 1/4 cup of water at a time. 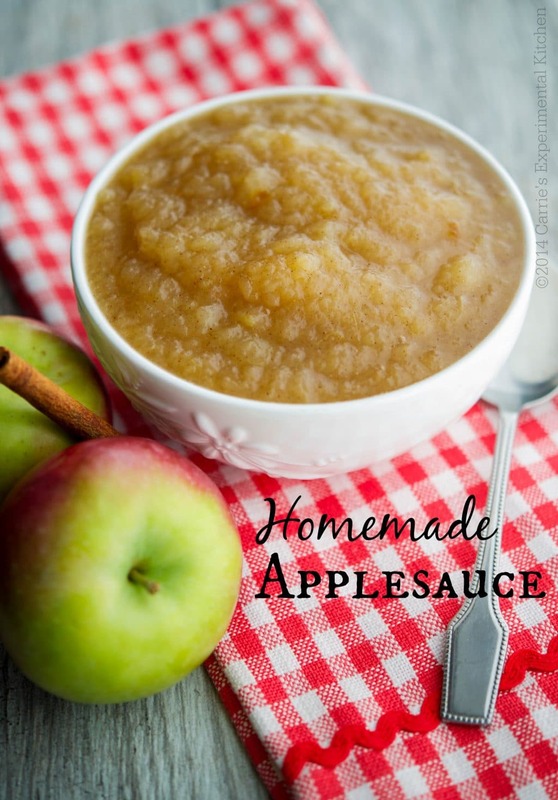 If you add too much, your applesauce will be too thin once you’ve mashed the apples. So I just made this recipe with the help of my kids. They couldn’t wait to taste it…they ate it warm…and before I knew it, it was almost gone! Needless to say, less than 2 hours from cutting apples for the first batch, I’m making a second one So my husband has some when he gets home from work! Such a delicious recipe, thank you! I don’t usually peel my apples, which means less time spent on prep work. My apples are organic though, because I bag them, and I kind of like the pink color it gives them. Thanks for the recipe! I’ll have to try it with the skins on next time. I hope you enjoy the recipe! Looking forward to taste testing… my batch is simmering now! We usually keep the skins on and send through the food mill to save time on peeling too! I’m making this recipe for the 2nd time. My family loves it. This time, I’m going to not add sugar, but after it’s done cooking add maple syrup if it needs added sweetness. Also, I added 1 full tablespoon of cinnamon. We love cinnamon. Thanks for insipiring me! I did not use any sugar and got apples from an orchard!, I love it!! I will be making this again!!! Fantastic, I’m glad you liked it!